Soma Ayurveda Beauty Clinic offers you the age old secrets of beauty care which were once followed by the ancient royal families of India. Beauty care recipes involving various herbs, herbal extracts, fresh fruits and natural products, used by Indian princesses, are no longer a secret and are available for you to benefit from, at our Beauty Clinic. Every beauty programme offered here is designed on the Vata, Pita and Kapha principles to bring out your external beauty and to give a feeling of general wellbeing. Exclusive to the Clinic, these treatments use only natural ingredients and are formulated with a thorough understanding of the therapeutic effects of Indian herbs. On doing everyday jobs, the skin on the hands and the feet become rough and gradually loses its softness with age. Therefore, taking care of the skin is a must in order to feel and remain young. A beautiful hairstyle brings out the individuality in you and for making that happen, you need an expert who understands your hair and knows which hairstyle suits you best. All hair treatment prices vary according to the length of hair. The cleansing, toning, scrubs and face massages make use of a delicate combination of exotic Indian Ayurvedic herbs and the natural goodness of fresh fruits and vegetables. It gently cleans, exfoliates and nourishes your skin and makes it supple. 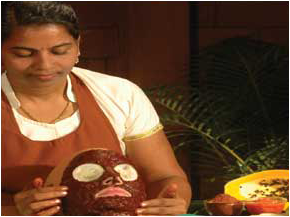 In this procedure, a special Ayurveda herbal paste is massaged vigorously onto the skin for about 40 minutes. This is good for exfoliating dry skin, strengthening the tissues and removing dead cells, cellulites and excess fat from the body. Many Indian women use homemade recipes passed down from mother to daughter to nourish their family and their skin. Following this custom, we use fresh, all natural ingredients. This facial will also include a face massage that tones and nourishes the skin, making it healthier and leaving it with a natural glow. It is a special Ayurveda preparation which is anti-scarring and has a soothing effect. It also improves skin texture and enhances circulation and healing. It is a combination of Ayurveda medicinal remedies which has anti-scarring, healing and soothing properties. 30 Aloe vera’s use can be traced back 6,0C: it is icown as the “plant of immortality.it is also a proven skin healer. Aloe is said to improve collagen repair, hec I prevent wrinkles, it is a powerful detoxifies, antiseptic and tonic for the skin. For this invigorating treatment, a traditional mixture of Indian spices is used to improve circulation, cleanse the skin and bring about depuration. This procedure is particularly helpful in treating acne and skin conditions like dermatitis, skin irritation, rashes and wrinkles. This Facial is enriched with green gram, sandalwood and other precious ingredients. it provides a deep cleansing treatment, giving sheen and lustre to the skin, tightening the pores and minimising blemishes. It has been used -c -ect open pores, pigmentation, scars, freckles, wrinkles, dehydration and in damages. Neem is perceived in India as a beauty aid. Powdered leaves are a major component of this procedure, which heals acne and removes pigmentation. Sandalwood is considered divine in India. It gives a cool soothing effect to the face and used to clear skin from blackheads and spots. A soothing moisturising treatment using essence of flowers unique in ayurveda medical remedies. This is a highly effective cleanser, which removes impurities from the skin surface, soothing the skin and replenishing moisture. Leaves the skin clean and petal soft. Specially suited to oily and acne-prone. The Gold Facial, based on Ayurveda, is a powerful anti-ageing treatment, with revitalizing and rejuvenating effects. Special technique of lymphatic massage is done, which helps lymphatic drainage and facilitates the removal of toxins and wastes. It also includes the entire facial steps, including deep pore cleansing, skin purification, toning, etc. The main ingredients of the facial are gold cream and gold gel which consists of 24 carat gold, aloe-vera, wheat germ oil and sandalwood. it suits both dry and oily skin types. Naturally exfoliating, fruit facials nourish the skin with essential vitamins and provide antioxidant A fruit facial mask can provide many benefits for the skin. A facial mask using the papaya fruit is great because the enzymes in the papaya help to remove dead and flaking skin. This facial is a mini face-lift, which deep cleanses, restores, balances and tightens the skin, Based on an ancient thermal mask Which has herbal extracts, The mask hardens, generates heat and creates the ideal temperature between itself and the skin, at which skin absorption is highly efficient. As it hardens, it tightens the pores, sculpting the facial contours, minimizing wrinkles and improving skin elasticity. The Thermohefb mask itself contains extracts of rose, basil and mint. This treatment makes use of a special Ayurveda formula which helps in removing dead cells and smoothing out the wrinkles. A fresh and relaxed feeling also accompanies the treatment. Threading, which involves the shaping of eyebrows and removing facial hair using a thread, is made available here. After the procedure, a balm is applied followed by a cool tower compress. This is the traditional waxing process with a touch of balm for healing, nourishing and pampering the skin. Henna is a transparent natural dye that coats the hair shaft,binding with the keratin.It conditions the hair giving it shine and body. Mehendi is very ancient and has gaineda lot of popularity over the years. It is also referred to as a temporary tattoo. Application of Mehendi on various body parts looks very attractive. It has a unique appeal and hence has emerged as a great fashion statement. Mehendi consists of at natural ingredients hence it is safe and hazard free, it is very safe as it doesn’t cause any skin problems. AppointmentsPlease call our Ayurveda Hospital or Reception making an appointment with us. Being on time for your appointment is greatly appreciated. Valuables While we endeavour to look after your belongings, the Beauty clinic will not be liable for loss of your valuables. We urge you to leave your valuables in the safe located in your room. Men are requested to shave a few hours prior to a facial treatment. Please avoid shaving or waxing one day prior to body/face scrubs. For greater comfort during Beauty treatments, you may prefer removing hearing aids, spectacles or contact lenses. Take rest and avoid vigorous activity for at least one hour after treatments. Drink water before and after all treatments. Guests with high blood pressure, heart conditions and those who are pregnant or have any medical complications, are advised to consult their doctors before signing up for any Beauty clinic treatments/services. Please let your Beauty clinic therapist know of any medical conditions. Treatment style, procedures and products may vary according to the constitution of the person. To preserve the tranquil environment of the Beauty clinic, you are requested to switch off your mobile phones, pagers and electronic devices at all times. Speaking at low volumes while at the Beauty Clinic will be much appreciated. In accordance with the Beauty clinic’s cleanliness and hygiene commitment, the equipments for all services and treatments are sterilised and sanitised.